Are you a lender busy making business acquisition loans and tired of fumbling through time-consuming, outdated, and unreliable business valuation spreadsheets? Have you ever hired a third party business valuation appraiser just to find out that the business didn’t meet the purchase price? Are you left with the task of determining an appropriate CAP rate and wondering if the boilerplate templates available are even relevant? If the answer is yes to any of the questions above, then you will benefit from the use of an internal business valuation tool in your lending process. Internal valuation sources are valuable to all lenders for all business loans, regardless of the size or purpose of the loan. Internal valuation tools are quick and easy desktop valuation solutions used in place of undependable internal spreadsheets. Many of these internal spreadsheets were created years ago and may only depend upon unspecific multiples and standard cash flow projections to obtain a value. Today, internal valuation technology exists that utilizes a three valuation approach (income, assets, and market) in conjunction with lender driven industry-specific multiples. This approach enables lenders to make sound lending decisions faster and more efficiently. Excellent as pre-screening sources, internal valuation tools are used to “sanity check” the value of a business at the beginning of the loan cycle. Before engaging a costly third-party valuation firm just to discover the deal won’t appraise out, the use of a reliable internal valuation tool can save lenders both time and money because it provides a faster and more comprehensive approach to assess value. Internal business valuations can also act as valuable resources for measuring “reasonable profit expectations”. For example, when lending based on projections, some internal valuation sources allow the user to search a specific NAICS code and to determine their average revenue, EBITDA and seller’s discretionary earnings (SDE) percentages. They can also help determine reasonable CAP rates which eliminates the need to use the arbitrary 20% standard CAP rate commonly used by many lenders. 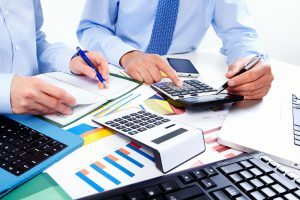 The use of internal business valuation tools mitigates lender risk and equips the lender with the accurate business values necessary to make fast, sound and efficient lending decisions. Lenders, do yourself a favor, start using Banker Valuation’s Internal Business Valuation Tool today! You’ll wonder how you ever lent money without it.